The woodcut print depicts doves and pigeons serving as an offering for worship. There are seven birds, mirroring the days of creation. In the story of Noach, birds heralded hope for the future and brought the promise of life on earth to the residents of the ark. As archetype, they possess significance in that they inhabit earth, sea, and sky, evoking humanity’s deepest aspirations and fears. Birds assume the persona of angel: messenger, guide, harbinger of life and death. Professional Background Ellen Holtzblatt is a Chicago-based artist whose paintings explore the connection between the physical and the spiritual. 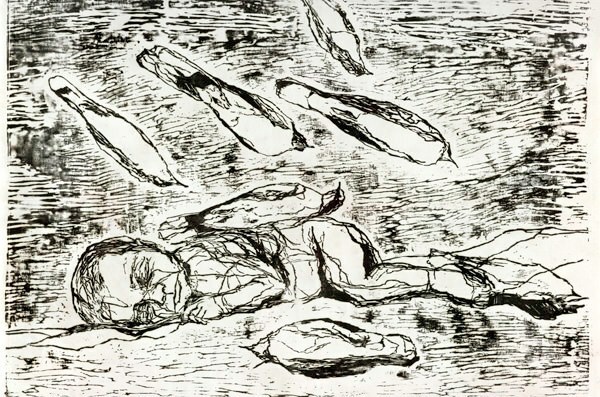 Holtzblatt has exhibited her work at the Museum of Biblical Art in New York, Inselgalerie in Berlin, Josef Glimer Gallery in Chicago, and Yeshiva University Museum in New York. Holtzblatt earned her degrees from the School of the Art Institute of Chicago.